Android Camera Image Test Suite (ITS) is part of Android Compatibility Test Suite (CTS) Verifier and includes tests that verify image content. 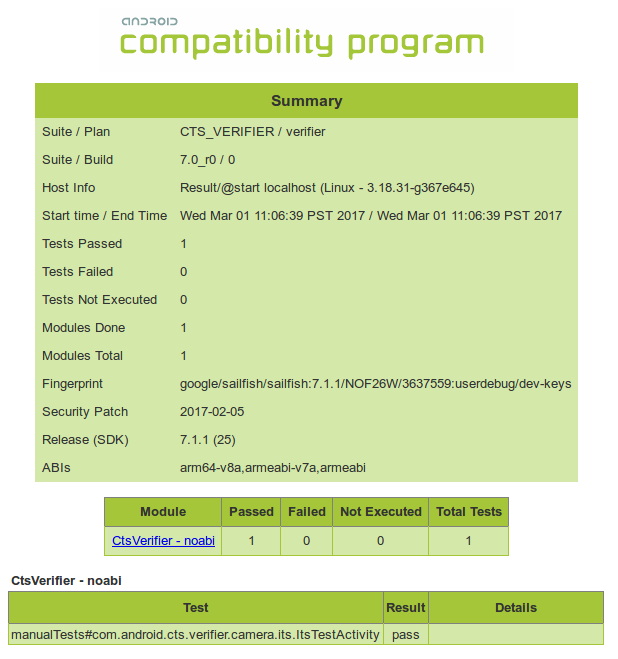 As of CTS 7.0_r8, CTS Verifier supports ITS test automation via Camera ITS-in-a-box; support for manual tests continues to ensure coverage for all Android device form factors. Automation. No human intervention is needed during the test. Reduced testing time. Parallel testing of front/back camera cuts testing cycle time by 50%. Easier troubleshooting. Consistency of test environment leads to fewer setup errors and increases reproducibility. Efficiency. Ability to retry for individual Camera/Scene improves test execution efficiency. ITS-in-a-box consists of a plastic box that is laser cut from computer-aided design (CAD) drawings, a chart tablet, and a device under test (DUT). You can use the wide field of view (WFoV) ITS-in-a-box, which is capable of testing both WFoV (FoV > 90 degrees) and RFoV (FoV < 90 degrees) cameras, or the regular field of view (RFoV) ITS-in-a-box. Purchase or build a wide field of view (WFoV) or regular field of view (RFoV) ITS-in-a-box. Configure a tablet with Camera ITS software. Get results from the DUT. This section provides step-by-step instructions for setting up a tablet for use with the CameraITS software. These instructions use a Pixel C as an example tablet. For information on tablet requirements and recommendations, see Tablet requirements. Charge the tablet and power it on. If prompted to set up an account, skip it (CameraITS does not require any account paired with the tablet). Update the tablet to Android 7.0 or higher. Android 6.x and lower versions do not support CameraITS. Return to Settings and select Developer options. Determine DUT and chart IDs by running $ adb devices to list available devices. To determine device_id and chart_id, plug and unplug devices and observe the devices that connect and disconnect. 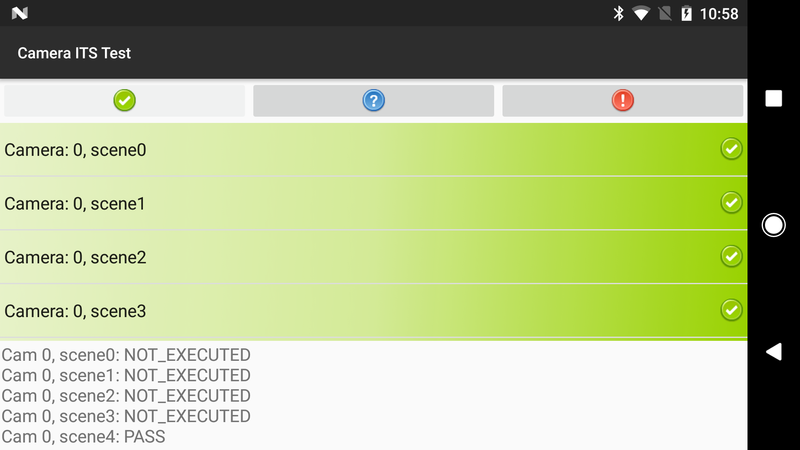 Perform three test runs to suppress hints and user prompts that can obscure charts on the tablet screen. Scenes 2 and 3 require the tablet to display an image, so the tablet prompts you to "Allow Drive to access photos, media, and files on your device?". Clear this prompt (and prevent future prompts) by pressing Allow. Run the command again. The tablet prompts you to "Keep a copy of this file?" and suggests Google Drive. Clear this prompt (and prevent future prompts) by pressing the Drive icon then Cancel for upload to drive. Finally, run tools/run_all_tests.py and confirm that scenes change automatically as script cycles through different scenes. While most tests will FAIL (as the camera is not pointed at the chart), you can verify the tablet correctly cycles through the scenes without displaying any prompts or other pop-ups on the screen. Scene 5 requires special setup with specific lighting (for details, refer to CameraITS.pdf in CTS Verifier, which you can download at Compatibility Test Suite Downloads). You can run Scene 5 separately (outside of the box) to test two devices in parallel. Figure 3. Camera scene 5. You can view results during testing and save the completed results as a report. 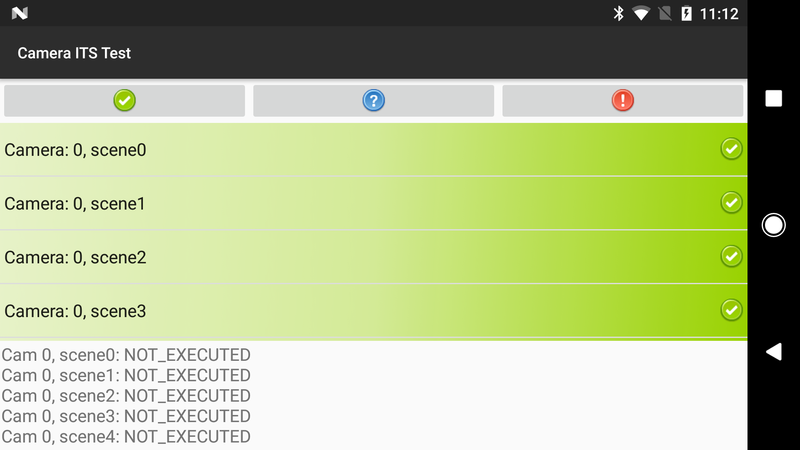 View progress of running tests. 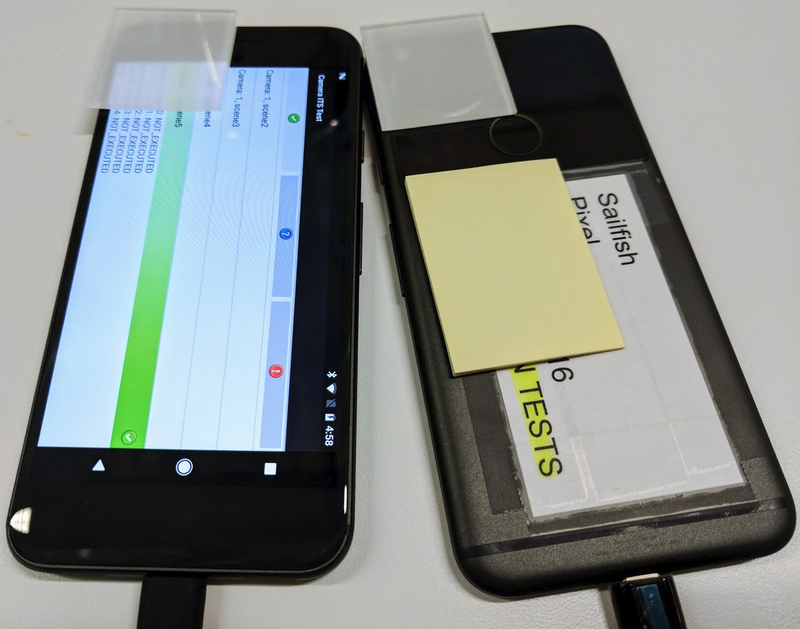 The command run_parallel_tests prints results only after Camera-Scene tests have finished, so to view results during test execution you must use Android Device Monitor or adb logcat to verify progress and/or view screenshots. Figure 4. Camera ITS report. Unzip the report file and view the test_result.xml. Figure 5. Camera ITS reports. Tablets must have a display size of around 10 inches with a screen resolution greater than 2000 x 1500 pixels. The DISPLAY_LEVEL value must be set in CameraITS/tools/wake_up_screen.py according to the tablet model. The table below lists the values for recommended tablets.